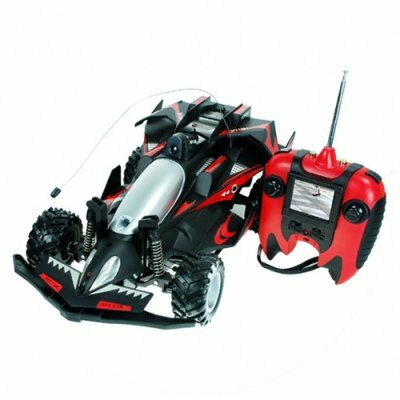 Successfully Added Deluxe RC Sportscar with Video Camera - 220V to your Shopping Cart. Wow!! Radio controlled sports car with video camera function. A unique toy that combines all the coolest features of a RC car with an added video transmitter for extra fun. Fun and easy to use RC car kit has everything you need to have a fun day in the park or play some games with your neighbors. The car has a remote control with an extra long range (up to 30 meters) and can control the cars movement by eyesight or via the LCD monitor. Maneuvering the car could not be simpler, the controller has sensitive left/right and forward/backward stick controls, while the controller itself is handheld and feels similar in function and use to a modern video game control pad. Tired of ripping this baby around the park or neighborhood? Then how about using your new RC sports car to play laser games with your friends? Yes, you got that right! This sports car has a laser function and can be used to play lasertag with your friends. And the fun isn't even over yet! You can also use the cars video transmission function to view what the neighbors are doing ;-). This isn't your fathers RC car, this is a 21st century toy for both children and adults. This premium featured RC sports car with video is being offered to you at our usual low wholesale price. Source this item for your online store and offer your customers a truly unique RC toy that they cannot find anyplace else. As always, you can order a single unit or stock quantity with our famous no M.O.Q. (no minimum order quantity) policy. Deluxe RC sports car with video camera function. Has laser shooting feature; play games with your friends and neighbors. Remote controller has 2.4" color TFT LCD video monitor. If this car uses infra-red control, can this car be operated outside line of sight? No, unlike RF (radio frequency) control, the car requires line of sight to operate.